lies in Kemandang Village, Tanjungsari district about 23 km in the South of Wonosari city. 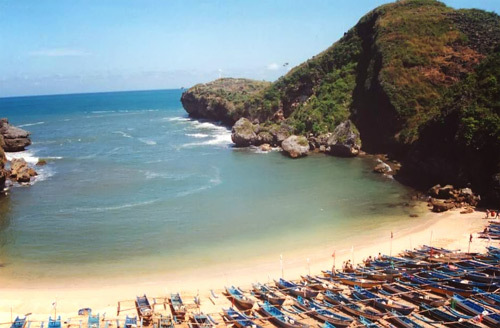 is the first beach that would be found in the junction of Baron, Kukup, Sepanjang, Drini, Krakal and Sundak beaches area. It is a bay with big wave. is popular as fish catching area. There is a mouth of Underground River that can be used for bathing after playing in the beach. The visitors can also enjoy various kinds of low prices seafood or fresh fish and Baron’s special menu namely Kakap fish soup. There is limestone hill in this area. The visitors can reach that place by passing through a path. The way to go there is very interesting because it passes a place called Pegunungan Seribu (a thousand mountains). Visitors could have a magnificent view of the beach; about 10 kilometers in the West of there are Parang Racuk hill with its mountain slopes. It challenged the visitors to do some adventures. Every syuro month (the first month of Javanese calendar), the fisherman societies organized a Labuhan sea ceremony, to express their gratitude to the God for the abundant fish harvest and for the welfare in fishing.